I thought since I gave you a really good pasta cream sauce yesterday, I'd stick with the pasta theme but go a different direction. Have I ever told you that spaghetti is one of my all time favorite things to eat? There's something I just love about the stuff. It's such a comfort food for me. And here's something even more insightful, or maybe a little embarrassing...I love Spaghetti O's. Please don't judge. I know it's one of those disgusting kid meals, but I loved them when I was a kid and every now and then, more specifically when I'm sick, I secretly indulge. They just make me feel better. Again...please don't judge. But when I'm not sick, and in my right mind, I love to make real meat balls with my spaghetti. So A few weeks ago when I put spaghetti and meatballs on my menu plan, I had an idea. Lately I've been obsessed with all things miniature. Have you tried the new mini pasta's that are in all the grocery stores? I love them. They are so easy for little r to eat. 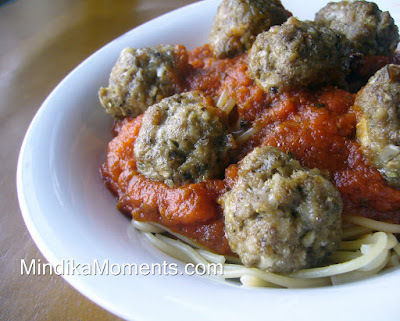 I think the mini pasta's and my love of Spaghetti O's are what sparked this idea... How about mini meatballs?? I just took my tried and true meatball recipe and shrunk down the balls. They were so good! Maybe it's because they were so fun to eat...he he...what can I say...it's the little kid in me! I do have a good recipe for a homemade marinara sauce, I'll have to post it in the near future. But in all honesty I simply use Prego 90% of the time. Prego Meat, or original are my favorites. 1. In a large mixing bowl, combine all the ingredients. Using your hands, mix until all ingredients are well combined. 2. Preheat the oven to 375 degrees. Spray a baking sheet or large pan with Pam cooking spray. 3. Roll the mixture into ½ inch “mini” balls. Place on the baking sheet about ½ - 1 inch apart. 4. Spray the top of the meatballs with cooking spray and bake for 20-25 minutes or until done. 5. Makes about 75 meatballs. *If you have a food processor, you can put the mushrooms, onion and garlic in whole then pulse until finely minced. **This recipe makes a lot of meatballs. With my small family, I only cooked about 1/3 of them. I placed the remaining meatballs on a baking sheet and separated by ½ inch. Then I put it in the freezer for a couple hours. I then placed them in a Ziploc freezer bag, for future dinners. When I’m ready to eat them, I'll simply take out the number I need, place on a baking sheet and cook at 350 for about 30-35 minutes or until cooked through. I've never liked spaghetti o's. I have always referred to them as "crap in a can". My kids however, did enjoy them. The mini meatballs look yummy!